Can you trust something that is 2,000 years old? We have a hard time accepting the stories of people who lived many centuries before us. Their testimony, no matter how ordinary or down to earth, seems like mythology. Our teachers trained us to be skeptical. The ancients were pre-scientific and often saw the world through a superstitious lens. This is the same attitude that people take toward the Gospels in the New Testament. We assume that they have been mythologized by a pre-Enlightenment worldview. Many people say that scribes revised the stories again and again through the decades. Some scholars have attempted to salvage a picture of the “historical Jesus” from the Gospels. Their goal was to identify a core set of his teachings that are not the legendary creation of the apostles. Skeptics argue that the New Testament cannot be a trustworthy resource for knowing Jesus. This kind of argument relies upon internal pieces of evidence. External evidence is the kind of resource found outside of the Bible. This data can come from archeology, ancient history, or letters. We have this kind of evidence from the writings of Josephus, Tacitus, and Pliny the Younger. Historians also use external evidence to determine the date and authorship of New Testament documents. Internal evidence is data that comes from within the pages of the New Testament. This is not “circular logic.” Using internal evidence means to test the documents for their authenticity by a couple of different means. A primary way to do this is by their internal coherence. If the Gospel authors contradict one another on crucial points in Jesus’ life, then that is a problem. Coherence is one of the reasons why scholars conclude that the “gnostic gospels” untrustworthy. They contain irreconcilable contradictions to the rest of the testimonies about Jesus. This is why it is a great benefit that we have fouraccounts of Jesus’ life. Though it may appear redundant, the Gospels offer us four independent testimonies to Jesus. Matthew, Mark, Luke, and John did not sit down and write their Gospels together. Instead, they wrote their accounts at different times and different locations. This fact is critical because it means that you can examine their reports to see how they match up. You can check for coherence. Christians since the early church have endeavored to create harmonies of the Gospels. They line up the testimonies to see how they each tell the same stories, teachings, or sayings. However, by careful reading, you can discover that they are not only harmonious but complementary. Timothy McGrew, professor of philosophy at Western Michigan University, and his wife, Lydia have recently revived an old argument from internal evidence. They base their work on these complementary attributes. If the Gospels are independent accounts of Jesus’ life, then we can assume that they will not be direct copies of one another. Assume that Matthew, Mark, Luke, and John were identical. That would imply that the authors had conspired or fabricated their stories. The McGrews have shown that they are not identical but interlocking accounts of Jesus. By interlocking, they mean that there are differences. Yet, these differences do not present discrepancies or contradictions — they are complementary. The interlocking variations of the gospels illuminate, explain, or corroborate the other accounts. The most unusual attribute of these interlocking differences is that they seem to be entirely unintended. The fundamental idea is that one author will mention in passing a detail that happens to explain a question raised by another book. We would not expect these kinds of features if the Gospels were all copying one another. Also, these kinds of details are not to be expected if they were meant to be noticed. It is difficult to object that these passing comments are only coincidences. This evidence builds a cumulative argument for the Gospels’ reliability. When you add up all these undesigned coincidences, they create a picture of eyewitnesses giving accurate testimony. In Luke’s Gospel, Jesus is on trial before Pilate for the charge of being a messianic revolutionary. Pilate’s job was to stop those kinds of uprisings. So, in Lk. 23:1–4, Pilate asked Jesus if he was a king and Jesus apparently answers in the affirmative. Pilate then said that he found no fault in Jesus. How can that be so? John gives us a fuller picture of the conversation. In Jn. 18:36, Jesus said to Pilate, “My kingdom is not of this world… If my kingdom were of this world, my servants would fight, so that I wouldn’t be handed over to the Jews. But as it is, my kingdom is not from here.” Jesus’ cryptic answer was enough for Pilate to understand that he was not a threat to Rome and did not deserve punishment. So, John explains Luke. You can find another example in Matt. 14:1–2. In this passage, Matthew wrote that Herod the tetrarch heard about Jesus and became suspicious of him. He worried that Jesus was John the Baptist’s ghost come back to haunt him. You might wonder, how would the Christians have known about the conversations in Herod’s court? In Luke 8, Jesus is traveling with his disciples, and Luke lists some women who were going with him. In verse 3, he wrote, “Joanna the wife of Chuza, Herod’s steward; Susanna; and many others who were supporting them from their possessions.” There is no parallel in events or themes between the passages in Matt. 14:1–2 or Lk. 8:1–3. Luke just happened to mention that one of the women close to Jesus was married to an official in Herod’s court. Thus, Luke explains Matthew. These are only a couple of example of the scores of undesigned coincidences that have been found in the New Testament. 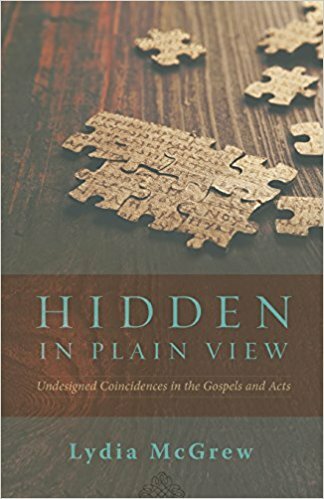 As I said before, one or two could be explained away as coincidence or intentional deception; however, the cumulative case made by this internal evidence provides a strong case for the authenticity of the Gospels.